Junior defender Annie Turnbull has been an integral part of the Jeff’s defense throughout the 2014 season. 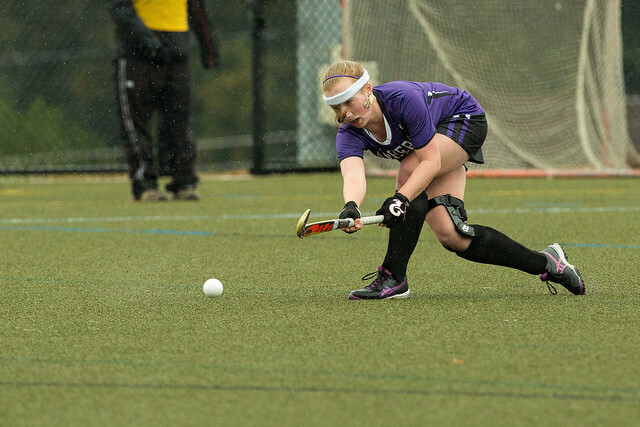 Amherst College field hockey continued its impressive run, beating Smith handily, 4-0, this past Thursday. The Jeffs, winners of 10 straight, now sit at 12-2 on the year and 7-2 in the NESCAC. Katie Paolano ’16 had a standout game earning four points on the day with her goal and two assists. Despite dominating offensively in the first half with 13 shots on goal, the Jeffs could only convert one of those opportunities in the first 35 minutes of play. Madeline Tank ’15 was the scorer, netting her 13th on the season. The chance began when first-year Mary Grace Cronin beat a Smith defender, putting a shot on net that bounced off the keeper’s pads to a waiting Tank. The Jeffs carried their 1-0 lead into the break, looking to add insurance in the second half. And that’s exactly what they did, coming out of the intermission strong and scoring just over a minute into second half action. Paolano earned one of her two assists on the play, setting up Annika Nygren ’16 to send a shot right through the wickets and into the back of the cage. The tally was Nygren’s 10th on the season. Another assist was credited to Paolano in the 55th minute of play as the junior forward carried the ball up field, eventually finding Ellie Andersen ’15. Andersen converted the opportunity, tallying her eighth point and third goal of the 2014 campaign. Paolano put the game undisputedly out of reach in the 63rd minute as she netted a goal of her own. Syndey Watts ’17 sent a hard shot on goal that bounced off the Smith keeper’s pads right to Paolano who corralled it and put a shot back on net. Amherst finished with the 4-0 win, their third consecutive shutout and eighth on the season. Amherst held decisive advantages in both shots, 29-2, and penalty corners, 14-0. The Jeffs’ defense did not allow a single shot in the second half of play. Amherst will host the contest on Wednesday, Oct. 29 beginning at 7 P.M. on Gooding Field. Trinity is currently ranked 11th in the nation and comes off an impressive 7-1 rout of Conn. College. The Jeffs narrowly edged the Bantams, winning by a 3-2 margin in last year’s regular season matchup. The game is also the 2014 regular season finale, as the team still awaits their seeding and location for the NESCAC quarterfinals set to begin on Saturday, Nov. 1.